« The cost of health? There are many things that are different here in Argentina. One of the most notable is the seasons. While our friends in Minnesota and throughout the US were marking the Fall equinox last week, we were celebrating the arrival of Spring. Here, the trees and flowers are budding and blooming, and the temperature is rising. Days are getting longer and birds are singing everywhere. This makes for a strange experience of the Jewish holidays. Wednesday evening was Rosh Hashanah-the beginning of the 10 days of observing the Jewish New Year. For all of my life, this holiday has fallen during the cool days of Minnesota Fall. We typically spend part of the day outside, bundled in fall jackets and scarves and enjoying the crisp air and the glory of the fall colors. These physical signs have always gone hand in hand with the holiday for me. It makes sense that the year is coming to a close as the growing season also comes to a close. It is the end of the cycle-a time to wrap things up, reflect upon how it all went, ask for forgiveness (whether symbolically or in person) and prepare to start anew. This, shared with family is the essence of this holiday for me. So, it is not surprising that it was a bit strange to try to get into the new year spirit as the life cycle is just beginning. 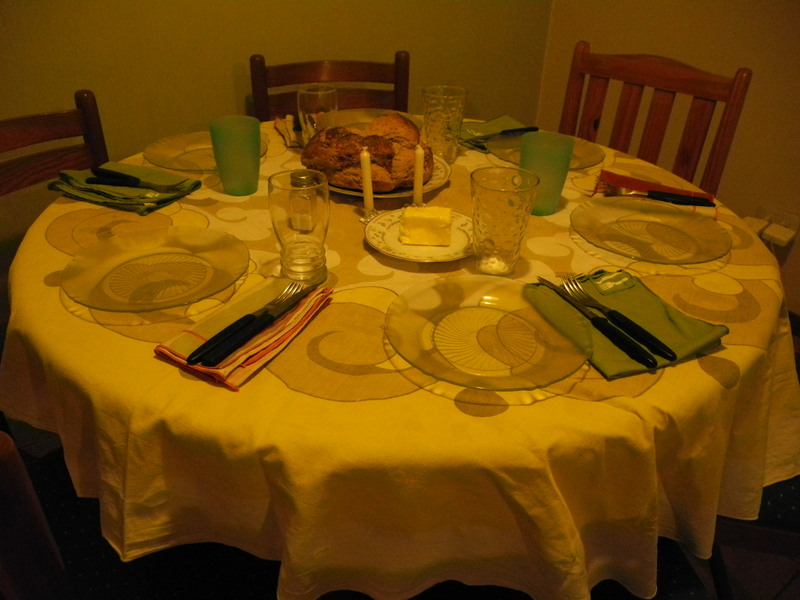 As with all Jewish holidays, much revolves around the meal. Therefore, I decided to prepare some of the familiar, and traditional foods and to create Rosh Hashanah in our new home. There are a few must haves. 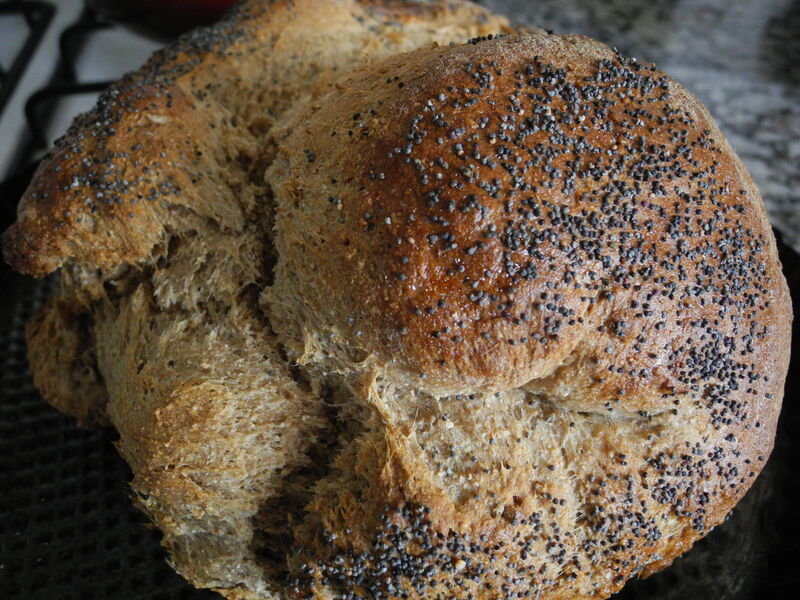 While on most other holidays, the Challah (Jewish egg bread) is braided, on Rosh Hashanah it is prepared in a circle to symbolize the complete cycle of the year. Another important symbol is sweet foods, to encourage a sweet new year. In particular, apples are dipped in honey, and often we finish the meal with honey or apple cake. The meal itself has many variations, but in my family brisket is traditional. While I am not a big meat eater, I felt that it was only right to prepare this old world delight for my family. Root vegetables are another popular item, with dishes like tsimmes or potato kugel. 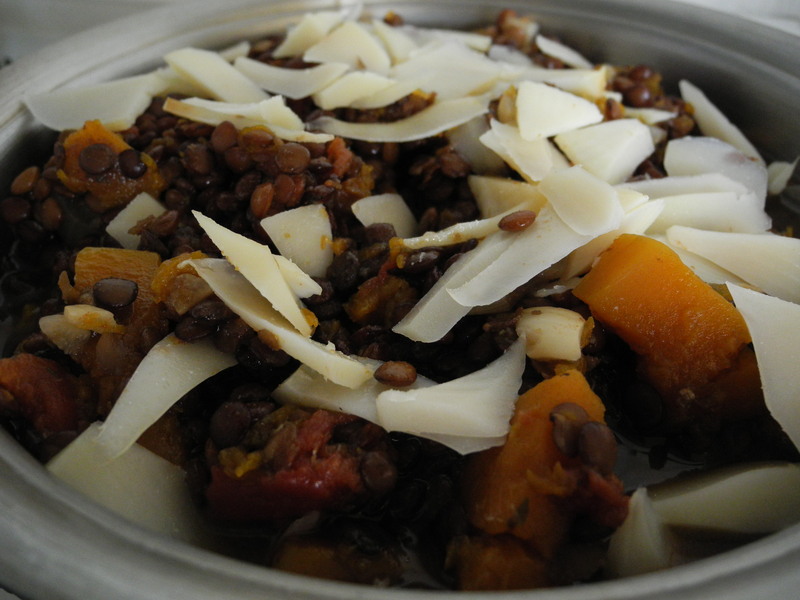 I got a little creative here and decided to make a lentil dish (round food) with squash and tomatoes. 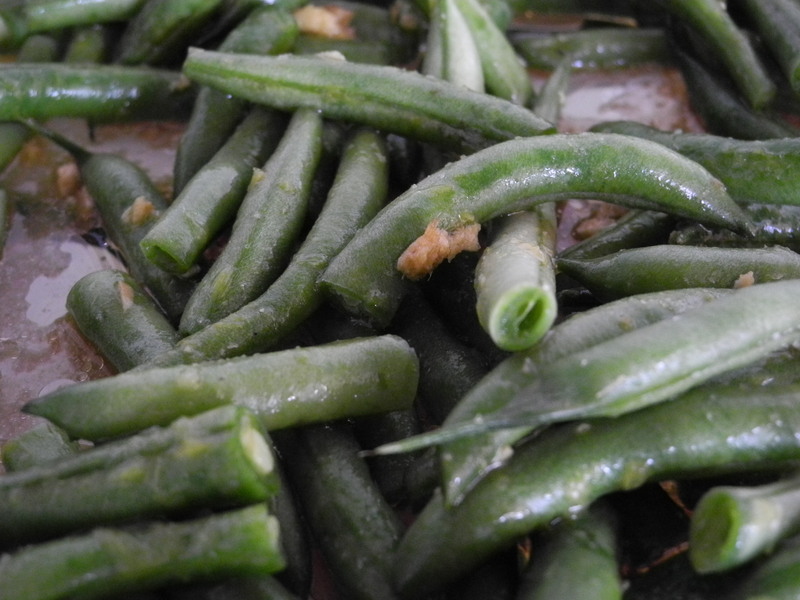 We also had gingered green beans (from my cookbook), and a lovely salad. And I prepared a yummy apple-honey cake with cream cheese icing and walnuts for dessert. 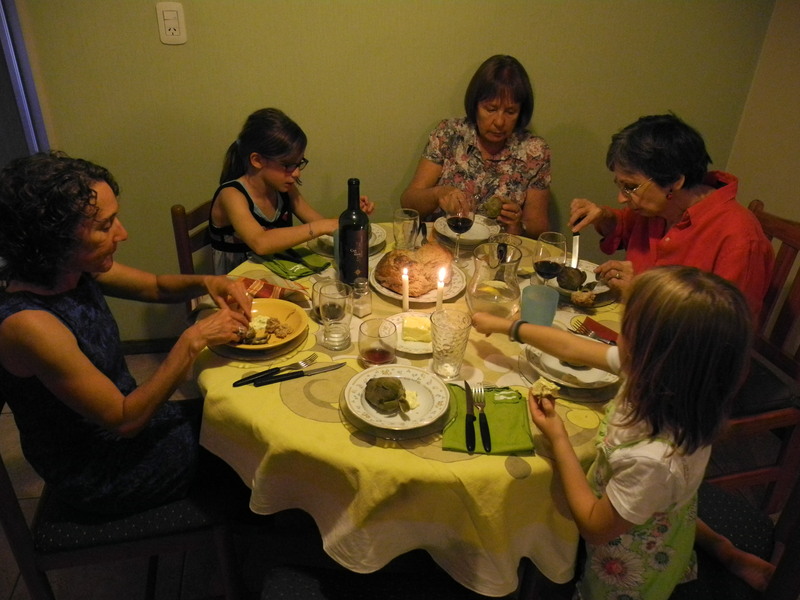 We invited our neighbor Marta (the grandmotherly Catholic woman who was honored to share the holiday with us) and a new acquaintance who is a Jewish woman from Minnesota (what are the odds?). It was a lovely, low key holiday that reminded me that the essence of Rosh Hashannah is to be together with those we love, to observe the rituals and traditions and to always reflect on how to improve our relationships and ultimately our lives and the lives of others. Cover and cook in 350 degree oven for about 3 hours. Check every half hour and distribute the sauce with a spoon. Turn the meat at least once during cooking. 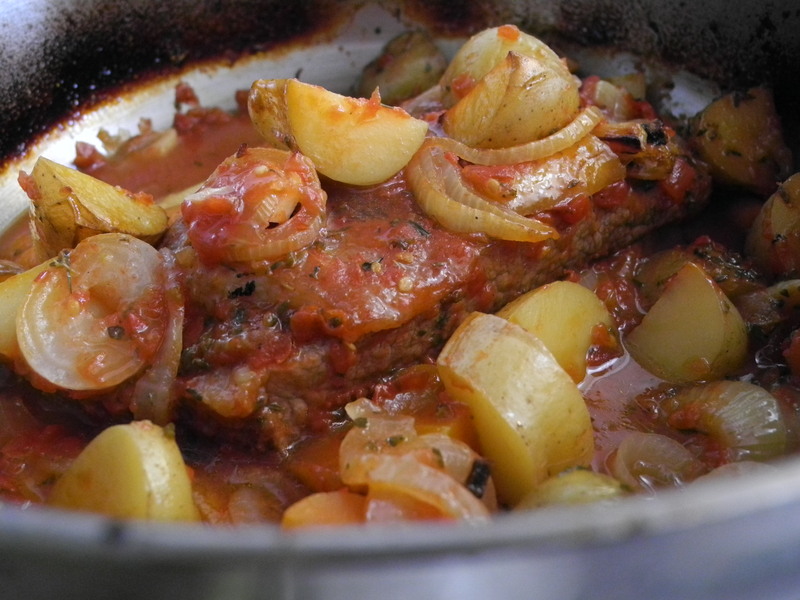 The meat should be very tender, and begin to pull apart when ready. It is delicious when prepared one day ahead of time and then re heated. Happy New Year to you and your family! You are missed! Hope everything down south is going great! Jenny, thank you for sharing, continuing and nurturing your traditions.